Mine: I want to like this movie, but it does not quite make it. Holly is beautiful and charming, John Goodman is always fun, but some how this never really gets moving. Feels disjointed. Leonard Maltin/Plot synopsis: Leonard Maltin Summary for Always (1989)	�	Page 12 of 29 From Leonard Maltin's Movie & Video Guide. 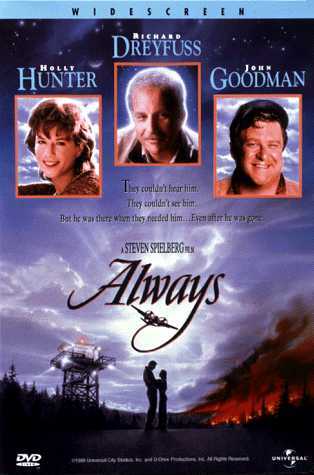 Slick remake of 1943's A GUY NAMED JOE, with Dreyfuss as a cocky pilot who specializes in dousing forest fires from the air, and Hunter as the dispatcher who loves him--and fears for his life. When he does in fact die, he returns in spirit form to guide a young pilot (Johnson) who wants to pursue the same career and the same woman. Certainly entertaining but suffers from a serious case of The Cutes. Hepburn, in her final film appearance, plays an angel.